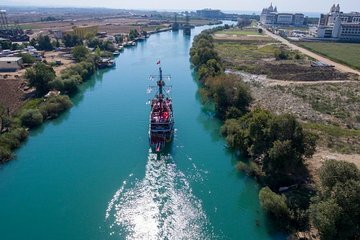 Get a taste of local Turkish life on this full-day guided cruise along the Manavgat River. Pop ashore to haggle for goods at a lively bazaar in Manavgat town and visit the famous Manavgat waterfall, as you enjoy this all-inclusive, fully-catered river cruise. Enjoy swimming breaks, lookout for giant loggerhead turtles, and enjoy lunch (with unlimited beer and wine) on board.